The Japanese creation story begins in a time of primordial chaos, and from this the god Izanagi and the goddess Izanami emerge to create the Japanese islands. This is the first tale in The Kojiki, the oldest surviving Japanese book. It tells of the ancient legends of Japan, beginning with tales from the spirit world, moving to stories of the mortal world, then telling, often through poetry, of the histories and divine origins of the imperial family. The book is regarded as one of the main Shinto texts, not because it contains any religious teachings per se (Shinto has no religious texts), but because it tells the mythological history of Japan from a time when its culture and beliefs were grounded in the old faith. It’s difficult to understand another culture or the thinking behind its stories and history without first understanding the myths and folklore at the foundations of its beliefs. It is these ancient stories that form the basis of our thoughts and actions—and here we find the cut and dry nature of the ancient Japanese views, and legends that trace the Japanese emperor to divine origins. It always interests me that all cultures, no matter how remote and distant from one-another, all share similar stories of origin. Nearly all have their creation stories, their own pantheon of Gods, and their own tales of the sages and heroes who formed their cultures. There is a universality in tales of origin. What makes The Kojiki especially interesting is that it’s not just a collection of myths and legends, but instead works as a chronological history of Japan. And what is even more interesting about The Kojiki is how close these recorded histories came to being forgotten. It was transcribed from oral tradition by Yasumaro, from the words of Hiyeda no Are (said to have had an extraordinary memory), and was then presented to the imperial court in 712 A.D. The English translation from Tuttle Publishing goes back to Basil Hall Chamberlain (1850 – 1935), who read and translated The Kojiki in 1882. It was reprinted in 1919 and 1920 as a supplement to Vol. X of the Transactions of the Asiatic Society (which were destroyed in the earthquake and fire of 1923). The version from Tuttle Publishing is based on a print that belonged to the late W.G. Aston, and includes his numerous annotations—which so many years later now act as historical texts in themselves. There are three major English translations of The Kojiki. Basil Hall Chamberlain translated it in 1882, Donald L. Philippi did a version in 1969, and Gustav Heldt did a version in 2014. 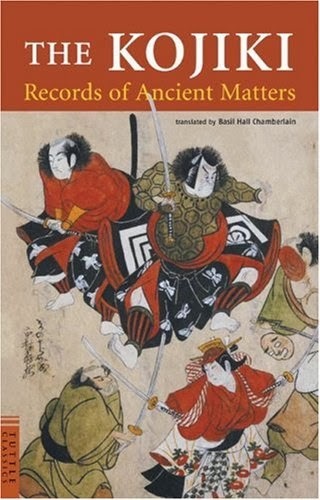 I’ve been looking at the earliest English translation of The Kojiki, since it contains notes and footnotes that are historical records in themselves—and also show a unique perspective from that time. Being translated nearly a century-and-a-half ago, the translator was able to see more clearly the nature of the Japanese people at a time when traditional culture was still very much alive. are eightfold fences made by me. There are key differences between the modern translation and the older translations. If you read closely, you’ll notice that the modern translation has removed the idea that the clouds themselves are alive, and the implication of a divine being at work, and inserted “made by me,” which refers to the husband. Here, the 2014 translation is subtly reductionist and atheist, and, as a result, quite un-poetic and inauthentic. There is also the shift from the original third person perspective in the older versions (which is closer to the ambiguity of the original Japanese) to the 2014 version’s first person perspective. As a result, the original sense of oneness between the poet and humanity is infused with modern individualism that is so uncharacteristic of Asian societies relative to Western societies, even today. The publisher notes that the stories in the book were taken as fact up until 1945 and Japan’s defeat in World War II. It gives a unique perspective of how the Japanese people thought, at a time when these stories were seen as truth. The annotations give it additional depth, showing this culture from the perspectives of a Westerner in the early 1900s in what would now be seen as an otherworldly land. The Kojiki is an interesting read, but it’s not necessarily entertaining due to its dry nature—something that’s set in sharp contrast to the environment of hyper entertainment of today’s Japan. Its foundation is the somewhat chaotic beauty of what is natural, and the divine hierarchy that brings order to chaos. Fascinating,– I had not heard of this– and this article is especially informative since it briefly outlines the history of translation and recommends what the author feels is the edition most true to the original. Fascinating, especially comparing the modern and older translations and its implications, and how the subtlest things reveal huge philosophical differences. Mr. Philipp, thank you for reminding us of the importance of early literary texts. It is frequently true that the scholarly work of earlier centuries is more profound, and sometimes, as you have pointed out, more accurate, than that of later times. From the Kojiki itself of 712, poems from the legendary Emperor Ojin and the ill-fated Prince Kinashi no Karu are of most interest to me. The Man’yōshū, the “anthology of ten-thousand leaves,” of over 4,000 poems, published in the same century in 759, contains the work of my favourite Japanese poet Kakinomoto no Hitomaro.